Patient Advocates Jack Aiello and Nancy Kaufmann stress the importance of communication and share tips to stay in sync with the treatment team. This special feature and the Global Patient Leadership Council Multiple Myeloma Roundtable were sponsored and moderated by Takeda Oncology. Jack Aiello and Nancy Kaufmann are paid consultants of Takeda. Takeda Oncology is the oncology business unit brand of Takeda Pharmaceutical Company Limited. All trademarks are the property of their respective owners. ©2018 Millennium Pharmaceuticals, Inc., a wholly owned subsidiary of Takeda Pharmaceutical Company Limited. One of the many things that you probably did after receiving a diagnosis of multiple myeloma was to select a doctor and care team. They helped you to learn about multiple myeloma and how to navigate the complexities of treatment decision-making. As you have continued with your multiple myeloma journey, your relationships with members of the treatment team have grown. New team members may have come into the mix as your medical needs have changed. For example, if you underwent a stem-cell transplant procedure, a transplant doctor and specialized team of nurses and care coordinators cared for you. When the goals of your care change and you need to make decisions about things such as advance directives, living will, and end-of-life care. As the treatment team has evolved and new members have come in, are you sure that they are actively communicating with each other about your care? If you have had a stem-cell transplant, is your transplant doctor communicating with your oncologist after your follow-up visits to the transplant hospital? What about your visit to a multiple myeloma expert at a large cancer center? Is he or she communicating with your local oncologist after seeing you? Is your primary care physician aware of the details of your multiple myeloma journey? A survey conducted by Takeda Oncology and The Lynx Group in April and May 2017 showed that more than 400 people with multiple myeloma identify their hematologist/oncologist (78%) and primary care physician (61%) as key members of their treatment team (see Figure 1). As a follow-up to this survey, a group of patients, caregivers, advocacy group leaders, nurse practitioners, and nurse navigators were brought together at the Multiple Myeloma Patient Advocacy Roundtable. They discussed the survey results and provided personal insights on key topics, including treatment team communications. The roundtable participants agreed that survey responders showed they were interacting with key team members, but they were particularly surprised to see that only 61% of the patients listed primary care physician as part of their treatment team. The participating healthcare professionals discussed the challenges that they face when patients with cancer want their oncology office to serve a double role as their primary care office. Another question in the survey asked patients with multiple myeloma about other medical conditions, and whether they are regularly seeing a physician to manage them. 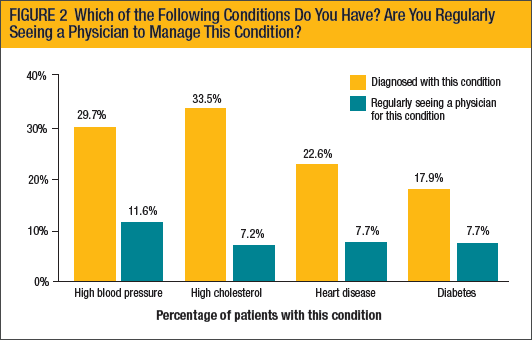 Although approximately 30% of the survey responders reported having high blood pressure, and approximately 34% reported having high cholesterol, most patients with these conditions do not regularly see a physician to manage them (see Figure 2). Several roundtable participants were also troubled about patients with cancer who do not go to dentists and optometrists, or do not get regular annual physical exams by their primary care physician. The healthcare professionals participating in the roundtable emphasized the importance of patients with multiple myeloma continuing to see other physicians for medical conditions that are not related to their multiple myeloma. In addition to talking with each other in person and via telephone, members of your treatment team have sophisticated tools that they use to keep each other up to date. One of the most important tools is their electronic medical record, or EMR, systems. You can think of your EMR as a computerized version of your medical chart. The EMR contains all the medical and clinical information that has been gathered in your doctor’s office. Improve overall quality of care. Your provider’s office can give you full access to your medical record. By accessing your EMR, you can see your medical details, including lab results, and learn follow-up information after an office visit or a hospital stay, including self-care instructions, reminders about follow-up care, and links to Internet resources. For more information about EMRs visit www.healthit.gov/providers-professionals/electronic-medical-records-emr. The roundtable participants recommended several steps to help your treatment team communicate well. Share important medical information with your treatment team at each visit. Bring a diary or notebook with your updates, questions, and concerns. Learn the names of your medications and their dosages (the number of times to take each day, and the amount), and keep track of your lab results (including the date of the test). There are numerous mobile apps that can help you manage your medications and provide reminders. Do not allow yourself to be rushed if your doctor or nurse seems busy. Tell each doctor about other doctors who care for you, and all the medications you are taking. If you have a cardiologist for your heart disease or an endocrinologist for your diabetes care, tell your oncology team. Tell your cardiologist that you have cancer and are being treated by an oncologist. Make sure your doctors are communicating with each other about your care. Your caregiver can update your nurse or patient navigator, pharmacist, financial advocate, and social worker as treatments change and as new decisions are made. You and your caregiver can e-mail your treatment team members through electronic patient portals. Although there are times when an urgent phone call is necessary, many nonurgent questions and needs can be handled electronically. Fully informed team members are a key element of well-coordinated care for patients with multiple myeloma. Your doctors, nurses, and pharmacists must be updated on your medical history and status as they make treatment recommendations and monitor your health. As your treatments and care plan change, it is critical for everyone to stay informed. This is the fourth of 5 articles that highlight recommendations from participants in the Multiple Myeloma Patient Advocacy Roundtable. Look for the last article, which will provide important tips and resources related to managing the cost of your multiple myeloma care.